Nineties pop Rock ‘N’ Roll extravaganza adds additional North American dates, including shows in Las Vegas, Los Angelas, Toronto and Philadelphia. Read on for a crazy trip down memory lane. 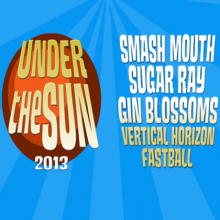 “Under The Sun 2013,” the marathon summer tour featuring Smash Mouth, Sugar Ray, Gin Blossoms and other chart topping stars from the Nineties, is rapidly shaping up as a certifiable summertime sensation. The North American trek – which will also see performances from Vertical Horizon and Fastball – has just unveiled an additional series of dates, including highly anticipated shows at Las Vegas’ Mandalay Bay Beach (on July 6th), Los Angeles’ legendary Greek Theatre (set for July 13th), Toronto’s Echo Beach at Molson Amphitheatre (on July 28th), and The Electric Factory Outdoor Stage in beautiful downtown Philadelphia (on August 3rd). “Under The Sun 2013” gets underway with a free 4 th of July extravaganza at Socorro, Texas’ Socorro Entertainment Center and then continues through the summer. Full details, including complete ticket information, can be found at www.underthesuntour.com. Smash Mouth, Sugar Ray, and Gin Blossoms teamed up to celebrate “Under The Sun 2013” with a week’s worth of showcase performances featured on VH1’s Big Morning Buzz with Carrie Keagan . The popular series spent last week broadcasting from Los Angeles and who better to summon the spirit of surf and summertime than the Under The Sun headliners, all of whom performed live from the famed Sunset Plaza House high in the Hollywood Hills. A number of the live performances and interviews can be viewed now exclusively via VH1: members of Sugar Ray, Gin Blossoms, and Smash Mouth join forces to chat about “Under The Sun 2013” HERE; Sugar Ray’s Mark McGrath discusses the upcoming tour and much more HERE; Smash Mouth performs “Walkin’ On The Sun” HERE; Gin Blossoms performing “Follow You Down” can be found HERE; Sugar Ray’s rendition of “Someday” is streaming now HERE, with their performance of “Fly” also viewable HERE. As if that weren’t enough, McGrath heralded “Under The Sun 2013” with a visit earlier this week to Los Angeles’ highly rated KTLA Morning News. An additional slate of high profile TV appearances will be unveiled soon. Presale and enhanced VIP ticket packages for “Under The Sun 2013” are available for a limited time at tixx1.artistarena.com/underthesun2013. The enhanced offer includes a reserved seat ticket, a limited edition “Under The Sun 2013” beach towel, a commemorative VIP laminate, and a tour poster signed by members of all five bands on the bill. Best of all, the VIP package includes access to a special Meet & Greet where fans can rub elbows with the headline artists. For complete ticket information – as well as updated tour dates and other news – please visit www.underthesuntour.com. Boasting cumulative sales of 25 million in the US alone, the five bands featured on “Under The Sun 2013” stand tall among the biggest and brightest stars of the golden age of alternative pop rock ‘n’ roll. “Under The Sun 2013” follows 2012’s “Summerland Tour,” a 31-date trek that packed sheds and arenas nationwide with a line-up co-hosted by McGrath and comprised of Sugar Ray, Everclear, Gin Blossoms, Marcy Playground, and Lit. With their indelible, organ-powered style, Smash Mouth has long provided the sun-dappled soundtrack to summertime fun. The Southern California-based combo has earned sales exceeding six million albums in the US alone, fueled by a streak of unforgettable chart-topping hits including “Can’t Get Enough Of You, Baby,” “Then The Morning Comes,” and the #1 classics, “Walkin’ On The Sun” and “All Star.” Furthermore, the band’s songs – including distinctive covers like “I’m A Believer” and “Why Can’t We Be Friends,” performed in the inimitable Smash Mouth style – have been featured in a breathtaking array of film and TV programs, including The Simpsons, Can’t Hardly Wait, Half Baked, BASEketball, Deuce Bigalow: Male Gigolo, and of course, Shrek. With founding members Steve Harwell and Paul De Lisle at the helm, Smash Mouth returned in full force last year with Magic , drawing praise once again for their ever-inventive beach party anthems. As if that weren’t enough, the hard touring band showed off their culinary credentials with Recipes From The Road , a rock ‘n’ roll cookbook/travelogue featuring contributions from such celebrity friends as Guy Fieri, Michael Symon, Sammy Hagar, and the Pittsburgh Steelers’ Jerome Bettis. For more, please visit www.smashmouth.com, www.facebook.com/smashmouth, twitter.com/smashmouth, and twitter.com/Steveharwell1. Mark McGrath is a true original. Best known as lead singer/songwriter for Sugar Ray, the Southern California-native can lay claim to a stunning string of top 10 hits, including “Someday,” “When It’s Over,” and the twin #1 classics, “Fly” and “Every Morning.” McGrath and Sugar Ray proved worldwide fan favorites, with multiple multi-platinum albums (including the RIAA 3x platinum certified 14:59), countless sold out tours, innumerable TV appearances, and starring roles on the covers of such national publications as Spin and Rolling Stone . More than two decades since their foundation later, Sugar Ray remain devoted to the cause that united them, the pursuit of good times, sunshine, and great rock ‘n’ roll. As if that weren’t enough, McGrath has enjoyed a high profile career as a multi-faceted TV personality. Among his many credits are stints as co-host of the entertainment news program, Extra , and as host of the nationally syndicated Don’t Forget The Lyrics! A three-time champion on VH1’s Rock & Roll Jeopardy, McGrath has also appeared on such hugely successful series as Fox’s American Idol, NBC’s The Celebrity Apprentice (Season 4), and most recently, ABC’s Wife Swap. For more, please visit www.sugarray.com, www.facebook.com/OfficalSugerRay, twitter.com/sugarrayband and twitter.com/mark_mcgrath. Gin Blossoms literally define the sound of jangle pop. From their late Eighties beginnings as Arizona’s top indie rock outfit, the Tempe-based combo has drawn critical applause and massive popular success for their trademark brand of chiming guitars, introspective lyricism, and irresistible melodies. Gin Blossoms soon unfurled a series of multi-format favorites, from “Hey Jealousy” and “Until I Fall Away” to “Follow You Down” and the GRAMMY®-nominated “As Long As It Matters,” earning sales in excess of 9 million in the US alone. In addition to the band’s own albums – including 1992’s breakthrough New Miserable Experience – Gin Blossoms songs were highlights of the RIAA gold and/or platinum certified soundtracks to such films as Speed, Empire Records, Wayne’s World 2, and several others. The band were also inescapable presences on TV, dominating MTV and performing on such shows as Late Show with David Letterman, The Tonight Show with Jay Leno, and Saturday Night Live. Lead tunesmiths Robin Wilson and Jesse Valenzuela reconvened Gin Blossoms after a brief turn-of-the-century hiatus and haven’t looked back. The band is among the busiest touring acts in the world, playing close to 150 shows a year (including a five city tour of Iraq and Kuwait in 2010) and releasing such acclaimed albums as No Chocolate Cake , which topped the Amazon.com sales chart upon its 2010 arrival. For more, please visit: www.ginblossoms.net, www.facebook.com/gin-blossoms, and twitter.com/ginblossoms. Vertical Horizon experienced meteoric success with 1999’s Everything You Want. The album was a 2x RIAA platinum smash, while its chart-topping title track made history as the Most Played Single of 2000. Fronted by singer/guitarist/songwriter Matt Scannell since the band’s early Nineties inception, Vertical Horizon remain a potent force in modern rock, touring non stop behind acclaimed releases like 2009’s Burning The Days. For more, please visit: www.verticalhorizon.com, twitter.com/VerticalHorizon and www.facebook.com/officialverticalhorizon. Fastball exploded out of Austin with 1998’s RIAA platinum-plus All The Pain Money Can Buy. Thanks to clever classics like the #1 favorite, “The Way,” the Texas trio proved power pop sensations, touring the planet while earning a pair of prestigious GRAMMY® nominations. With nearly 20 years of musical exploration under its belt, Fastball continues to kick out timeless rock ‘n’ roll, including such career highlights as 2009’s celebrated return, Little White Lies. For more, please visit: www.fastballtheband.com. For up to the minute news and complete tour information, please visit: www.underthesuntour.com. 27 Canandaigua, NY Constellation Brands Marvin Sands P.A.C.